Many girls has some facial hair on their upper lip, and they follow many ways like threading, waxing, bleaching to remove these ugly hair from the face. 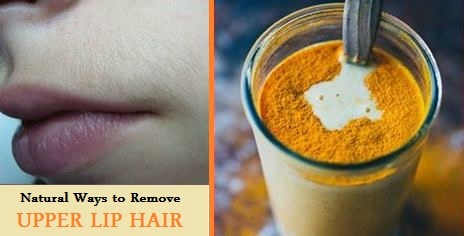 I am showing you 4 best simple natural ways to remove these unwanted hair easily do at your home. Turmeric powder used in many natural beauty products, it helps to clean your skin and make it glow. Milk is also beneficial for your skin, when it combines with turmeric powder; it helps to remove unwanted hair from your skin. Mix one tbsp of turmeric powder and one tbsp of milk in a bowl to make a paste. Apply this paste gently on your upper lip using your fingers. Wait for dry it completely, and then rub it off from your skin. Follow the remedy 3 or 4 times in a week. Gram flour also known as “chana dal flour”, it is very common ingredient to use many remedies that remove unwanted hair. Mix some gram flour, little bit of water and turmeric to make a paste. Now add little amount of fresh cream in this paste and mix again. Now apply this paste on your upper lip and leave it for complete dry it. After dry, scrub your upper lip opposite direction of hair growth. Follow the remedy 4 times in a week. If you don’t like smell of milk, then you can replace the milk with water. Take same quantity of turmeric powder and water in a bowl and mix them. Apply the paste on your upper lip, and leave it for 30 minutes. When it dry, rub it off from your skin and wash with normal water. Egg white also good remedy to remove upper lip hair, it also soothes your skin soft and smooth. Take a bowl and add one egg white, little amount of corn flour and sugar. Whisk it until it converts into sticky paste. Now apply this mixture on your upper lip. Let it dry completely, after 30 minutes peel it off from your skin. Follow this remedy twice a week for good result.